This isn't The Fault in Our Stars. It isn't even on the same shelf. I was looking forward to this next young adult novel by John Green, but was quite disappointed. 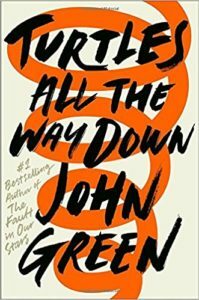 I find it interesting that all the commentary on the back cover of Turtles All the Way Down is about The Fault in Our Stars. The main character in Turtles is Aza, a high school junior with mental health challenges. She has “invasives” ... spirals, she also calls them. These are obsessive thoughts, mostly about microbes and C. Diff (clostridium difficile infection) and bacteria and other ways our bodies can be infected. These spirals, obsessive and ever-tightening, make relationships, school, and life itself difficult for Aza. For this reader, they were simply boring and depressing. I found no redeeming qualities in this story, and I read it all the way through. If it is already on your reading list, my suggestion is to cross it off. But, of course, if you have read it, I/we would love to hear your opinions, especially if they differ from mine! I read this on the suggestion of someone who read a favorable review; I think it was the NYT. Anyway, this was my first young adult book. It was interesting to be in the heads of a few young adults. John Green has been open about his own compulsive behaviors and I believe this is what shaped this book. I’m not sure I’ll seek out another young adult book; there are so many adult books to choose.